Contra-polar (negative) energy is a concept that has been investigated by many researchers beginning in the mid 19th century, when the nature of energy was beginning to be understood from a truly scientific perspective. Entire theories of universe and matter-antimatter creation have been published, reviewed and refined. This article from the April 1955 edition of Popular Electronics reports on then-current applications of contra-polar energy. At the time, most such work was performed in secret government laboratories and at test ranges that were closed to the public and results banned from publication, but since that time freedom-of-information-act requests have opened much contra-energy research information for public access. Negative light. produced by contra-polar energy. removes light from the area affected. Any developments in electronics which took place during World War II are still secret, because of the requirements of military security. However, the announced policy of the Government is not to apply security classifications to information which might be of use to the general public unless such classification will serve an actual military requirement. Also security classifications are removed when the conditions which originally necessitated them no longer exist. POPULAR ELECTRONICS is now in a position to reveal to the general public one of the most interesting phenomena yet discovered in the field of electronics - that of "contra-polar energy." Those who are familiar with the develop­ment of the atomic bomb will remember that the feasibility of the bomb was first demonstrated mathematically by Dr. Lise Meitner, the German mathematician, several years before World War II, and that its theoretical feasibility was first called to the attention of our Government by Dr. Albert Einstein. The problem then became one of finding out how to apply the mathematical formulae. The case of "contra-polar energy" is similar, but, since some of our readers may be more interested in the applications of the new principle than in the mathematical basis of it, we shall defer the mathematics to the end of this article. 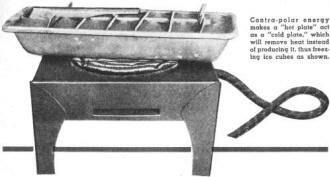 Contra-polar energy makes a "hot plate" act as a "cold plate" which will remove heat instead of producing it, thus freezing ice cubes as shown. This formula involves a square root; elementary algebra tells us that the square root of a positive number may be either positive or negative. That is, + 4 equals either + 2 times + 2 or - 2 times - 2, so the square root of + 4 equals either + 2 or - 2. If the square root of LC may be either positive or negative, it follows that ƒ, the resonant frequency of the circuit, may be either positive or negative. Now, the reactance of an inductance is proportional to the frequency used; if the frequency is negative, the reactance would be negative. The current through an inductance is equal to the voltage divided by the reactance and a negative reactance would produce a negative current. A small amount of resistance in series with the inductance would not shift the phase of the current very much and the current through the resistance would still be negative, or 180 degrees out of phase with the voltage. Power dissipated in the resistance would be equal to the voltage multiplied by the current, but if the voltage is positive and the current negative, the power would be negative. 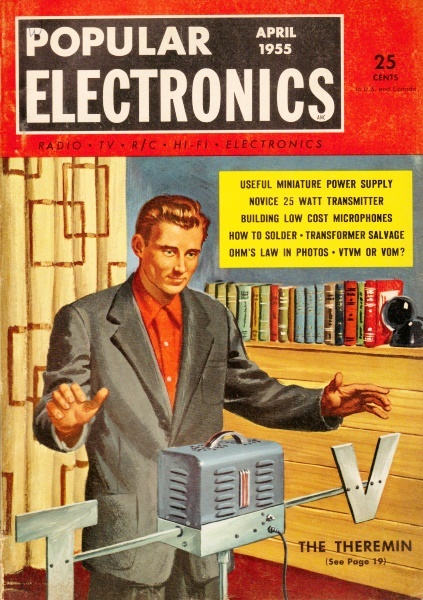 In other words, with an alternating voltage of negative frequency applied to a large inductance and a small resistance in series, the resistance would not absorb power, it would deliver power!1 It has been known for some time that so-called "negative resistance," as in the dynatron2 and transitron3, would deliver power, but this is the first indication that ordinary positive resistance also can be made to deliver power4. Another effect of negative heat: when a soldering iron is plugged into a socket carrying contra-polar energy, ice crystals are formed. 1 Those of our readers who may be unfamiliar with the foregoing mathematical relationships between electrical quantities can find an explanation of them in any standard textbook. 2 Albert W. Hull. "The Dynatron - A Vacuum Tube Possessing Negative Electrical Resistance," Proceedings of the Institute of Radio Engineers, Vol. 6. p. 5, 1918. 3 E. W. Herold, "Negative Resistance and Devices for Obtaining It," Proceedings of the Institute of Radio Engineers, Vol. 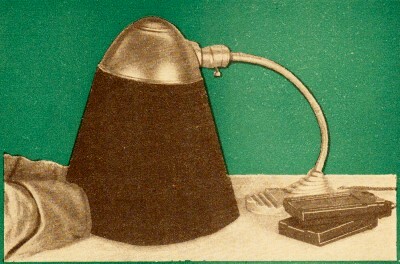 23, p. 1201, 1935 . 4 Transactions of the Contra-Polar Energy Commission, Vol. 45, pp. 1324-1346 (Ed. Note - A reprint of a document found in a flying saucer).